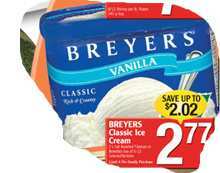 Breyers Classic Ice Cream is on sale forÂ $2.77 (regular price about $4.50) in this weekâ€™s A&P and Dominion flyers. Note that the Ice cream on sale is the Breyers Classic not the Breyers Natural Ice Cream. I personally find that Breyers light chocolate doesnâ€™t taste as good as the regular chocolate Ice Cream. Yet, I noticed that while their light Ice cream has less fat it still has almost the same amount of calories. Click here to read this week’s full A&P or Dominion grocery flyers. _No longer having personal transportation, I buy my ice cream at a close by Price Choppers (it’s a Sobey’s extra low-end IGA). They carry lower-quality Chapman’s, Nestle Parlour and no-name. _And while I like Chapman’s enough (such as, an all-green mint chocolate) – the local store’s carried flavours are always limited: ie; they never carry “Tiger Tail”. Just last night they were reduced to a usual stant handful of bland vanilla mix flavours.